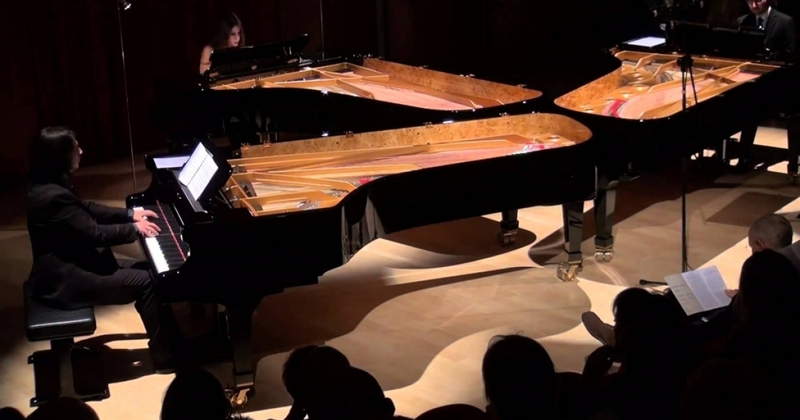 The Pianos Trio is formed by Carlo Maria Griguoli, Alessandro Stella and Giorgia Tomassi. In June 2014, Warner Classics released the cd 'The Pianos Trio - Live in Lugano', including all the performances of the Trio previously published by Warner Classics in the annual box sets dedicated to "Martha Argerich and friends" from 2010 until 2014. Attracted by the idea of walking a hitherto unexplored musical path, pianists Giorgia Tomassi, Carlo Maria Griguoli and Alessandro Stella began their Trio adventure in June 2010 when they took part in the Lugano Festival’s prestigious Martha Argerich Project, performing a transcription by Carlo Maria Griguoli of Stravinsky’s Firebird Suite (1919 version). This most unusual of debuts was so successful that the three players have since gone on to form a lasting artistic relationship. They have won both public and critical acclaim for their subsequent appearances at Lugano, as well as at other leading venues in Italy and around the world. Their idea of reinterpreting and transcribing orchestral classics for three pianos, creating innovative versions that remain faithful to the spirit of the original, goes hand in hand with their desire to involve living composers in adding engaging new works to the existing repertoire. After Stravinsky’s Firebird Suite, each fresh transcription by Griguoli and each performance has marked a significant stage in the Trio’s artistic growth and development: from the emotional and explosive satire of Shostakovich (Moscow Cheryomushki Suite, 2011), to the incomparable musical seascapes painted by Debussy (La Mer, 2012), or the sublime grace and elegance that emanate from the melodies of Offenbach (La Gaîté parisienne, orchestrated by Manuel Rosenthal, 2013) or the magical and grotesque atmosphere of Dukas's Sorcerer's Apprentice (2014). The Trio are also committed to contemporary music, and are the dedicatees of Vaalbara (2013), an impassioned and dazzling work by renowned Italian composer Carlo Boccadoro, who is particularly admired for his versatility, fertile imagination and richly pictorial creativity. In every piece in the Trio’s repertoire, the balanced and varied way in which the sounds of the three pianos are treated enables the individual instruments to assert themselves at times, but also to blend together as one in an intense process of “musical osmosis”.